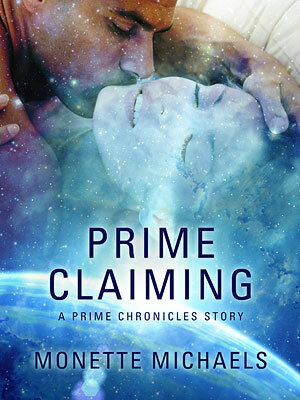 A Prime Chronicles Short Story- Prime Claiming is NOW OUT! Yes, just in time for the Holiday Season — a Prime Chronicles Short Story. When I was writing Prime Imperative, I had many fans asking whether there would be more stories in the Prime Chronicles world after I finished the third book. I had never really thought beyond the end of the third book, but with all the outpouring of love from my Prime fans, I decided to set it up so I could continue to write in this world for at least another trilogy. This short story is not part of the next trilogy, but more of a scene that occurred off-stage in the third book. Hey, I was inspired. 🙂 Cheri has such a large personality and I wanted to see how Zaek would handle it. I hope you all agree he handled Cheri very well. The action in Prime Claiming takes place during the action in Prime Imperative between Chapter 14, which was on the Galanti on the way to Cejuru Prime after picking up Bria’s team from the planet Oz, and before Chapter 15, about a week after they had arrived on Cejuru Prime. Warriors from the planet Prime are renowned throughout the galaxy for their strength and fighting ability. And when they meet their mate, they bond for life. Like all Prime males, Lieutenant Zaek Magga had searched forever for his mate…but he never expected her to be a Terran. Unfortunately, no Terran would be prepared for the reality of the carnal bonding process between a Prime male and his chosen mate. He decides to move very slowly. Cheri Stafford never expected to be a Prime warrior’s mate. But she is. At first, she’s thrilled, then…confused. After seeing how other Prime males act with their mates, Cheri doesn’t understand why Zaek is holding her at arm’s length. Doesn’t he want her? He hasn’t even kissed her properly. But when Cheri uses all her womanly wiles to get Zaek to move, she discovers how thoroughly an extremely dominant male warrior will claim his female. As for the trilogy, it will begin with Damon and Susa’s story for the romance arc. There will be a subplot which will carry continue through the trilogy, involving tracking down the exact toxin that harmed Prime females’ immune system and caused the infertility/miscarriage issues that were crucial in the first trilogy. The subplot will also focus on discovering and bringing to justice the Prime medical researchers and doctors who assisted the man behind the plot to destroy the Prime race (no spoilers here, but if you’ve read the third book you know who the evil mastermind was). Of course, this search into what and who will bring with it danger — and Susa has information she doesn’t know she has. And Damon will be forced to protect her since the trouble follows her to his jump station. But all that is for later. ~ by Monette Michaels on December 23, 2014.